Are you looking for a fun event for your whole family? Join Areyvut for a Chol HaMoed Pesach (Passover) event that features unlimited laser tag, bowling and arcade games! Cost: $25 per person. Sponsorship opportunities are available and all sponsors will receive an acknowledgement for tax purposes. 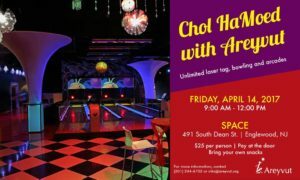 Visit http://bit.ly/PesachSpace to register in advance or you can just come join in the fun and pay at the door. Walk-ins are encouraged and welcome. Food: Since it is Pesach please bring your own kosher for Passover snacks.